The outstanding peculiarity of modern cosmology just consists in what, that it allows carrying out the high-precision measurements of the Universe physical parameters that were considered as impossible not so long ago. Talk, for example, about the measurement of cosmic microwave background anisotropy , about the polarization of cosmic microwave background , about the gravitational microlensing [3,4] and some other observable effects of modern cosmology. This peculiarity of modern cosmology allows using broadly the observable data for next development of theoretical models those processes that are the paramount for understanding the structure and evolution of the Universe. In doing this we concentrate our attention on problem that is orientating on the dark matter phenomena understanding, first of all. Some new results in this sphere have been presented in the recent article . This article organized as follows. In second section we briefly describe the shape of a galaxy’s halo of dark matter. 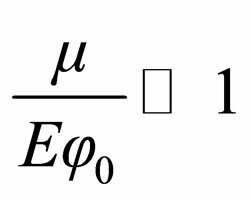 In third section we consider the scalar field of the oscillator type and demonstrate that standard scalar potential couldn’t be productively used for getting the adequate galaxies’ curve lines and determining the profiles of dark matter halo. For doing this it is necessary choose another type of scalar potential. This problem was searched in Section 4. 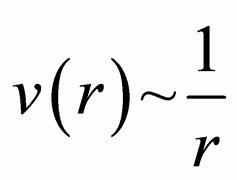 There was argued that global properties of scalar fields is possible describe by the central symmetric potential celestial-mechanical type, i.e. by . Section 5 was devoted to calculating profiles of dark matter halo and rotational curves of a galaxy on the basis of potential celestial-mechanical type. Some astronomical predictions concerning the physical characteristics of dwarf galaxies were argued in last sixth section. Talking about the dark matter it’s necessary mention the pioneer Zwicky article , where the idea about presence an unknown type of substance (dark matter) in galaxies was put forward at first. This substance ensures the stability of any galaxy. That is why the modern vision about the galaxy structure includes the dark matter halo as its indispensable component . According this as the simplest model of a galaxy the following system of number subsystems is considering— massive nuclei (the rotating black hole, usually), bulge, spherical stars shell, gaseous flat disc and halo of dark matter. Note that stars shell and flat disc have the common sizes in order of 10 Kpc, while the typical sizes of dark matter halo are about of 100 Kpc and larger. The observable data show that halo of dark matter contains the main part of galaxy’s mass (about 90%). The typical total galaxy mass estimates as , where —mass of the Sun [8,9]. Because the goal of our article is searching some properties of the dark matter, only, we’ll neglect all of galaxy’s components except the halo of dark matter in following. 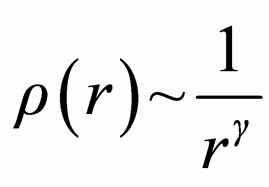 where —the potential energy of scalar field, —the metric tensor of an external gravitational field. Later on we’ll consider flat space-time, i.e. . 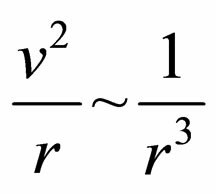 Expression (13) allows find the rotational curve line by equating it to the specific centrifugal force, i.e. Now question arises—how does the curve line (15) correlate with the real observable data? Basing on the observable results of dark and baryonic matter distributions in 34 bright spiral galaxies , we may conclude the follows. 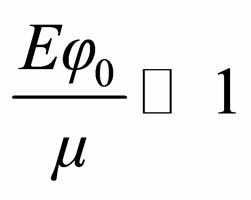 First, there are number of variants that modeling the density distribution of dark matter halos by N-body simulation method [12-14]. The most part of them predicts satisfactory that dark matter is essential to the inner radii of galaxies, i.e. for the regions where , in contradiction to maximal sizes of halo which we are considering previously. Second, the observable rotational curves don’t represent by the curve lines type of hyperbola. 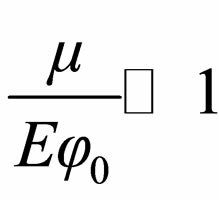 Hence, expression (15) is the result of poorly theoretical determined dark matter distribution even in galaxies where the presence of dark matter is dominant. 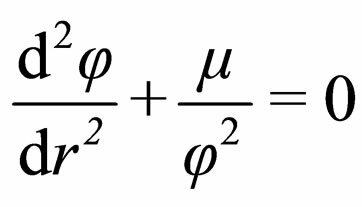 From all of sad above it is clear, that standard scalar potential couldn’t be productively used for getting the adequate galaxies’ curve lines and determining the profiles of dark matter halo. For doing this it is necessary to choose another type of scalar potential. Note that Yukawa-type potential for describing dark matter has been considered by A. Loeb and N. Weiner  recently. 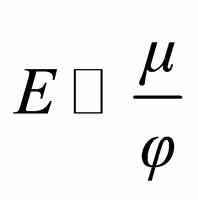 In fact, the potentials type of and analogous them (self-acting potentials, Higgs potentials, Yukawa-type potential, etc) are using for searching the local properties of the scalar fields on small space and time intervals (for very early and early Universe). But our aim is discovering the global properties of scalar fields that can describe the observable characteristics of dark matter on the cosmological space and time scales. where is any constant value. Its possible interprettation sees in Section 6. 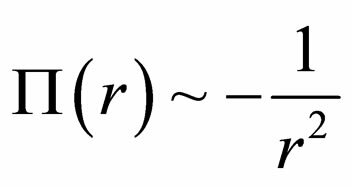 For deducing (16) we based on the Lagrangian of a probe particle moving in the central symmetric field and used the standard formal replacing and , that usually applies in the field theory . Now consider the field analogs of some types of movement that are interesting from dynamical viewpoint and having width applications in the celestial mechanics. For its inversing let and , where and are the main terms, while and are the small additives order of to them. That is why and . 2) Let the opposite correlation takes place. 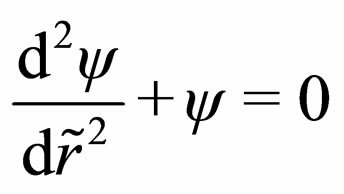 So, expressions (20) and (22) describe explicitly the scalar field potential in the whole region—closed to the center and far from the center—of dark matter halo distribution. Profile of dark matter is important characteristic of a galaxy structure. 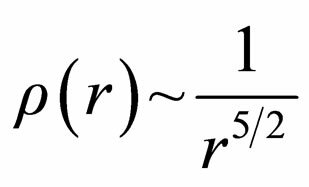 It allows calculate the corresponding gravitational potential, find the galaxy’s rotational curve and make some other cosmological conclusions. 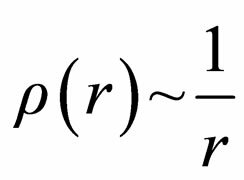 In most articles the profiles of dark matter halo and the rotational curves of a galaxy were searched by the N-body simulation method, mainly. But we’ll consider them from the theoretical field viewpoint. Now, basing on (20) and (22), it possible finds profiles of dark matter halo and rotational curve lines for any galaxy. At distances the mass density of dark matter becomes growth again. 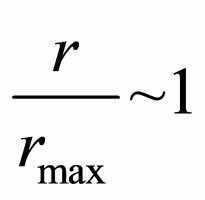 This circumstance is very important, because in the neighboring region the rotational curve line must possess by small “gap” that is possible observing in principle. Results of articles [19,20] gives that authors’ mean radial density profile at small distances decreases as that is in good correlation with our estimation (24). that analogously (15) is the direct consequence of (29), take places. From the geometrical viewpoint in coordinates this curve represents the line that slowly growth with distance increasing. 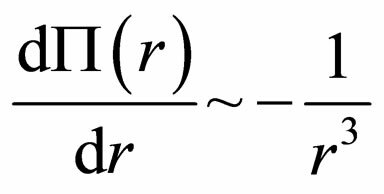 That is why the shape of line (30) is in good correlation with the real rotational curve lines, because starting from any distance all of them possess by a weak trend for growth with the distance increasing. The results of dark matter’s profiles observing at short distances (~ ), that are proofing our conclusion, present in article . 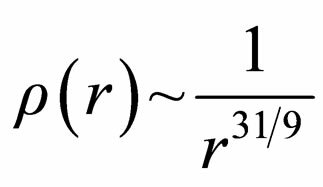 where is the corresponding small (order of ) constant value. 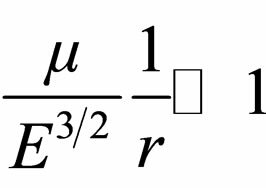 Examining article [19,20], cited above, we see that author’s mean radial density profile at large distances, contrary to our result (32), decreases more rapidly, namely as . The same conclusion follows from article , where the mass density profile changes according the dependency . But at the same time dark matter profile (32) is in good correlation with the results of article , where the shape of profile density for dark matter dominated dwarf and low-surface brightness late-type galaxies describes as , 0.2 - 0.4. 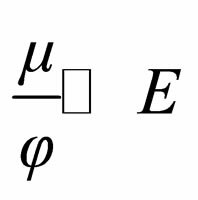 It is important to underline that instead of other articles the power index in profile density for such type of cosmic objects is smaller than unite. From the geometrical viewpoint in coordinates curve line (36) represents the line that growth with distance increasing more rapidly than curve (30). That is why its shape is differing from the real rotational curve lines. But it is necessary remember that theoretical curve line relates to large distances ( ), while all of having now observable curve lines were plotted for the short distances (about 30 - 40 Kpc). And now we once again are quoting the above mentioned article by Kravtsov and Klypin , where the rotational curve reproduces by dependency with 0.9 - 0.8. This power index coincides practically with our result (36). Note that behavior of curve lines (30) and (36), if they apply to galaxies movement, is also in good correlation with the results of searching hidden mass in the Local Group . From body of article we may conclude the following. Our choice of scalar field the celestial-mechanical type allowed productively describes the dark matter halo’s profiles at small and large distances. They are in rather good correlation with results of Kravtsov and Klypin on the modeling of profile density and rotational curve lines shapes for the dark matter dominated dwarf and the lowsurface brightness late-type galaxies. For the physical interpretation we assume that it is the ordinary celestial-mechanical parameter. 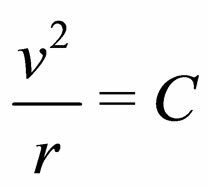 Hence , where is the gravitational constant, is the central gravitating mass.
. 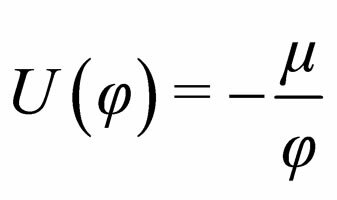 Hence, a particle mass is of order . 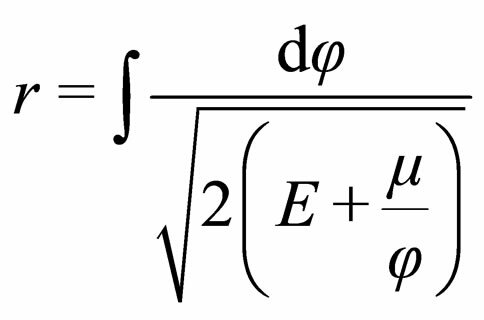 This estimation is in the likelihood correlation with the previous given minimal mass of dark matter’s particle . Moreover, because galaxy’s observable characteristics type of sizes is possible measuring with higher accuracy then its gravitating mass, expression (37) allows get possibility for more correct mass estimation. 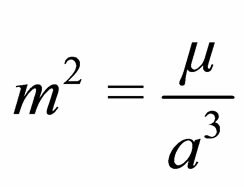 In fact, inversing this calculations we get the following mass for spheroid dwarf galaxies , i.e. they could be more massive than it is considering now. The author thanks professor A. D. Chernin (Sternberg Astronomical Institute, Moscow state University, Moscow, Russia) for his supporting of this idea and his initial acquaintance with the content of this paper. E. Komatsu, K. M. Smith, J. Dunkley, et al., “Seven-Year Wilkinson Microwave Anisotropy Probe (WMAP) Observations: Cosmological Interpretation,” Astrophysical Journal Supplement, Vol. 192, No. 2, 2011, Article ID: 18. D. Larson, J. Dunkley, G. Hinshaw, et al., “Seven-Year Wilkinson Microwave Anisotropy Probe (WMAP) Observations: Power Spectra and WMAP-Derived Parameters,” Astrophysical Journal Supplement, Vol. 192, No. 2, 2011, Article ID: 16. 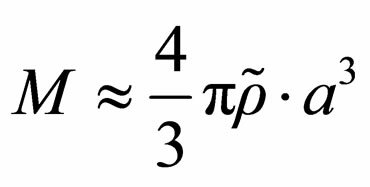 D. Clowe, M. Bradač, A. H. Gonzales, et al., “A Direct Empirical Proof of the Existence of Dark Matter,” Astrophysical Journal, Vol. 648, No. 2, 2006, pp. L109-L113. J. F. Navarro, C. S. Frenk and S. D. M. White, “A Universal Density Profile from Hierarchical Clustering,” Astrophysical Journal, Vol. 490, 1997, p. 493. E. Schmutzer, “Symmetrien und Erhaltungssätze der Physik,” Akademie Verlag, Berlin, 1972. 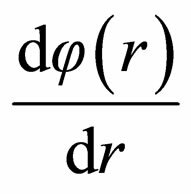 E. Rasia, G. Tormen and L. Moscardini, “A Dynamical Model for the Distribution of Dark Matter and Gas in Galaxy Cluster,” Monthly Notice of the Royal Astronomic Society, Vol. 351, 2004, pp. 237-252.